A mattress is an investment whether it’s for you or a tiny version for the newest member of your family. If you don’t protect that investment, you may end up having to replace it sooner than you’d like. Mattress protectors come in a few styles, but all of them help your family get a better night’s sleep. 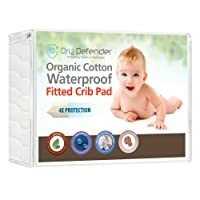 Since you’re building the perfect sanctuary for your baby, we’ve put together a list of our picks for best mattress protector for bedwetting and other issues that come with babies. Plus, we’ve answered some of your burning questions about how to choose. You can divide mattress protectors into two basic types: five-sided toppers and six-sided encasements. Five-sided toppers are probably first when you think of mattress protectors. They’re shaped like your fitted sheet, and you place them on the mattress where they stay thanks to elastic edges that grip underneath. These have a few different purposes. Some are purely liquid resistant. If your child’s diaper leaks in the middle of the night, it won’t soil the mattress itself, just the topper. Some have a lining on the top for an extra layer of comfort. These quilted editions help your baby sleep better, and some even improve the air flow through the mattress, keeping baby cooler. Many of the best mattress protectors for bedwetting are both. There’s a waterproof layer that keeps liquid from reaching the mattress, but the padded topper ensures the fabric is still breathable directly against baby’s skin. Encasements are six-sided and used to prevent allergens or bedbugs from infesting the mattress. They fit entirely around all sides, including the bottom, and the zip to form a tight seal. If your child suffers from dust or mite allergies, an encasement can help keep mattress allergies at bay. If you’re worried about bedbugs, or worse have an infestation, encasements can protect your baby. Encasements can also have water resistant properties, and many come with extra padding on top as well so that your baby is still sleeping comfortably and cool during the night. Most people don’t invest in a complete encasement, but if you do, you’ll want one rated for allergies or bedbugs, and that has a very tight seal with a zipper cover to prevent accidentally unzipping it. If you aren’t sure where to start, here are our top three picks and other types of baby situations. The last thing you want is that annoying crinkle waking your baby up every time he or she moves during the night. 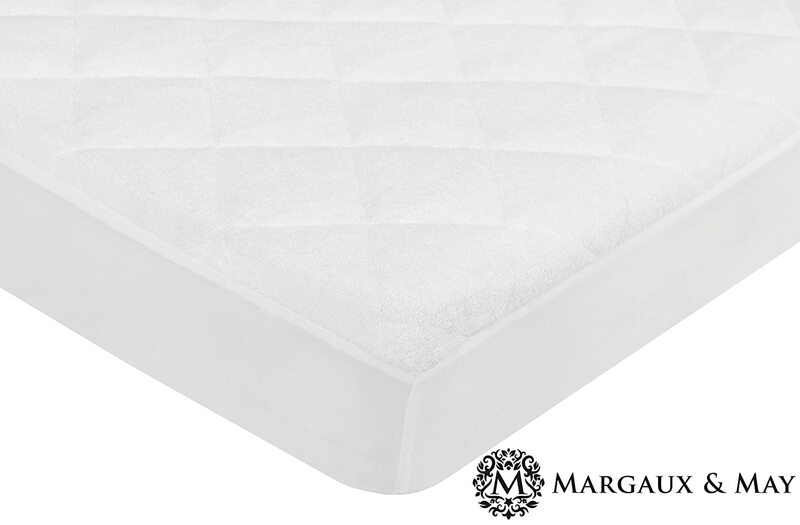 Margaux and May’s mattress protector is a soft, noise-free pad and topper that prevents liquid from reaching the mattress in the middle of the night. It’s easily washable, and bamboo is soft and hypoallergenic. It has a quilted, terry cloth top for a comfort layer and to increase airflow directly against your baby’s skin. The protector is durable, and they’ve tested it against a variety of conditions. When you wash the cover, be sure to wash on cold and dry on low heat, so you don’t damage its water resistance. It measures 52 inches long by 28 inches wide. It’s a full nine inches deep, so it will wrap around all crib mattresses and not slip around. It fits well under sheets because of the color (white) and the construction (thin, breathable bamboo). Dry Defender’s mattress protector is a soft, waterproof topper that doesn’t crinkle and has a guaranteed 100% waterproof capability. It has four layers. The first is an organic cotton top that’s breathable and helps keep baby’s temperature in the right place. The next is a polyester fill for extra absorbency. The third is a polyurethane layer that’s completely waterproof. Finally, the soft knit back helps the pad stay in place while on the mattress. It’s 52 inches long by 28 inches wide. It’s only seven inches deep, so if the bamboo cover was too much for your mattress, this one might have a slimmer fit (which is safer for babies anyway). Unbleached cotton is an excellent material for your baby’s crib because it’s hypoallergenic and breathable. The noiseless design prevents soils on the mattress but won’t make noise. You can machine wash it on warm to clean and then tumble dry on low. If you’re concerned about having non-organic materials, this pad may not fit the bill for you. The cotton does keep your baby’s skin away from the polyester and polyurethane, but it might be an issue if you want all eco-friendly materials. Our final recommendation is for those of you worried about bedbug infestations or who have babies with more severe allergies. The encasement is a full mattress protector with a zip enclosure. 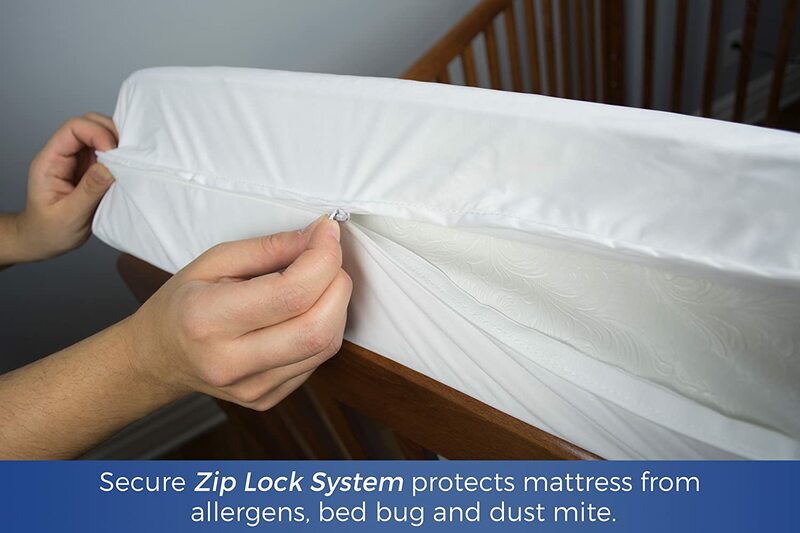 The zipper has inner and outer flap closures so bedbugs can’t wiggle their way in or out. Dust mites and other allergens can’t either. It’s completely waterproof and was tested rigorously for durability. It uses a soft knit fabric for breathability next to baby’s skin, so his or her temperature doesn’t get too warm during the night. It’s made of polyester, a durable and breathable fabric often used for sporting or outdoor activities. The polyurethane layer underneath is genuinely liquid proof and prevents stains from reaching the interior mattress. It filters out allergens down to 1.0 microns. It’s 52 inches long by 27.5 inches wide. It’s seven inches deep so it won’t fit an extra deep crib mattress but will easily encase most standard crib mattresses. It’s washing machine friendly although if you already have a bedbug infestation, the less time you spend with the encasement off the mattress the better. This encasement is excellent for long-term use for such cases. It has an extra long, rustproof zipper so that getting the encasement on the mattress won’t feel like a gymnastics event. If you don’t have exactly the right size of mattress, it might not have a very snug fit, but most average sized mattresses should be ok even with a little room. There are a few things that can help you narrow down your search. Be sure to consider each one as you explore your options for the best mattress protector for bedwetting. Anything that goes into your baby’s crib should fit snugly and avoid bunching. One of the leading suspects for SIDS is breathing issues. For the same reason that you don’t put big pillows inside the crib, you also don’t want pads and sheets that could bunch up and block your baby’s airway or create a pocket of carbon dioxide that could be deadly. Organic materials are best, but even more so, materials that are breathable. Breathable materials such as organic cotton keep your baby from overheating during the night or waking up sweaty. Old mattress protectors were made of thick plastics which were uncomfortable and created a lot of noise. Now, more eco-friendly materials are quieter and feel more like a standard mattress than plastic. Vinyl and PVC are past materials that were common but have been shown to cause breathing issues and allergens. They continue to off-gas throughout the life of the protector, so stay away from any protectors that feature these materials. Waterproof, or at least water resistant, properties are essential for a crib mattress pad. This is what keeps your mattress investment safe and prevents moisture from getting into the pad and mattress and breeding bacteria or mold. Many crib mattresses are water resistant themselves, but having an extra protector extends the life of the mattress. 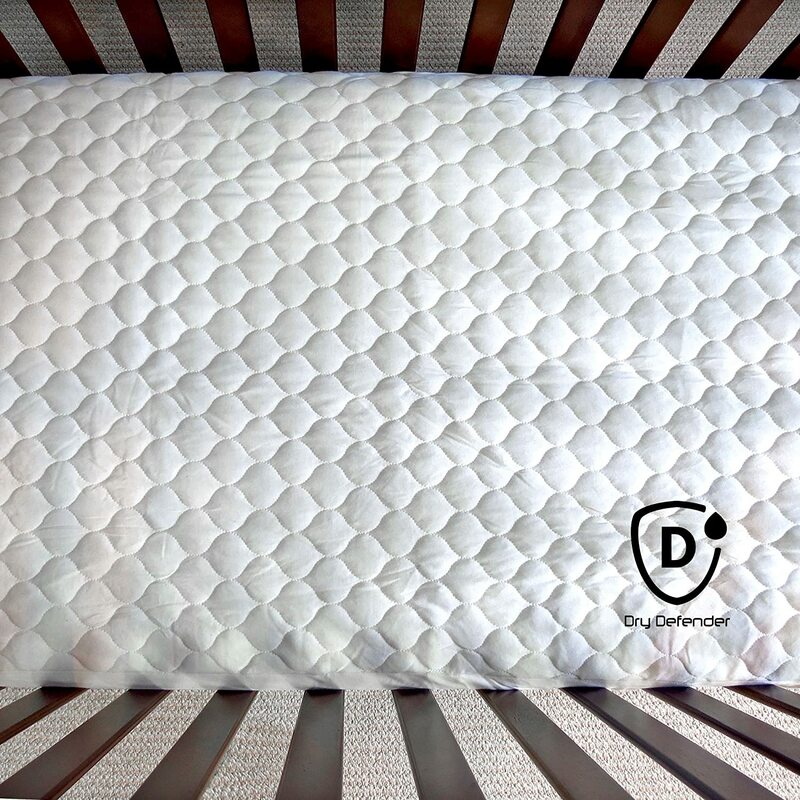 Your baby is going to cause a lot of messes during his or her time sleeping on the crib mattress. If it isn’t easy to clean, it isn’t worth it. All of the toppers on our list are machine washable on either cold or warm and can be dried on low. Some you can wipe clean if you catch the spill early. If you don’t, washing the entire thing is convenient. A correctly fitting, breathable mattress topper can improve your baby’s sleep and prevent common health issues. Soft toppers don’t cause any noise, but they do help regulate your baby’s temperature during the night. Getting the right protector extends the life of your investment and is one less thing you have to worry about after the baby arrives. 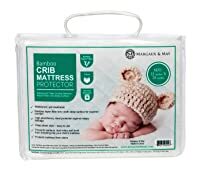 What kind of mattress did you get for the crib and how do you plan to keep it (and your baby) safe? Let us know in the comments below. What Causes Dust Mites In Bed?